So as I mentioned, Scott, Jaguar and I just spent five days in Kingussie, which is up near the Cairngorm Mountains. What a wonderful time we had! We stayed in a friend's holiday house (thank you again and again! ), where there was wood-burning stove and no internet. I'm not gonna lie, I think we suffered a bit of internet withdrawal for the first couple of days, holding our phones up in crazy positions trying to get some mobile connections with which to check our emails and go on Facebook, but in the end it was kinda nice being away from the digital world. Which is part lie because the house DID have basic TV channels, which to this no-TV family is a massive luxury. We watched plenty of "Come Dine With Me" and "Dinner Date" while we were there. But mostly, we just enjoyed each other's company. Jaguar was a bit grumpy half the time, but still, Scott and I had a wonderful time of just reconnecting, talking, taking walks down the quiet little street, going to cool places (which you'll be able to read about soon enough on SearchScotland.org!) and buying daily foodstuffs at the local grocers. It was definitely a step forward in my 2013 goal of learning about simplicity. 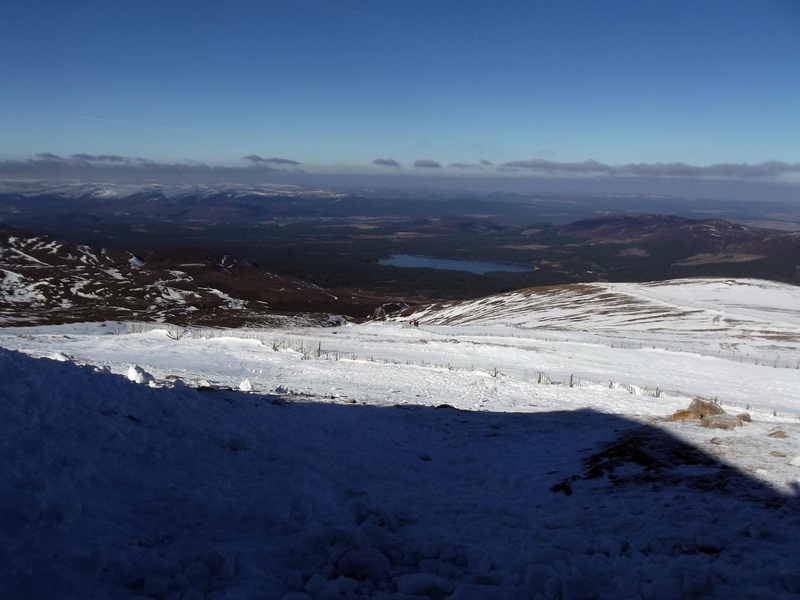 This time of year in the Cairngorms is skiing season, so we were able to soak in the majestic beauty of the snow-covered mountains. It was awe-inspiring, breath-taking, my heart was full to burst - all the cliches that in this setting become alive and true again. I felt peaceful, happy and fully alive up there. Maybe it had something to do with the thinner air, but it could also be just the slow-paced, quiet way of life in the mountains. We visited the Highland Wildlife Park, the CairnGorm Mountain and its funicular railway, and ate delicious food at the Silverfjord Hotel and Auld Alliance (wee plugs there for SearchScotland again, reviews of all will be posted shortly... after I finish writing them). We read books. We took naps. Ahh what a week it was. Here are a few photos we took while away. No photos could do any of the sights justice, but I sure tried. These are just some photos we took at the top of CairnGorm. It was so beautiful. I don't know how cold it was up there, but at the bottom of the funicular railway it was -5.5C, so I imagine it was much colder at the top. But it wasn't uncomfortably cold; it was really fresh and invigorating. Made me think learning to ski might actually be kinda fun. The monkeys at the Wildlife Park were my ultimate favourite. I love monkeys more than anything. It is my lifelong dream to hold and cuddle a baby monkey. I'm thinking seriously about getting a zoology course and becoming a zookeeper just so I can hold an orphaned monkey baby. This mama monkey nursing her baby was just too much for me. They both looked so serene and peaceful sitting among all the baby monkeys playing rough-and-tumble (and the littlest baby stealing the patch of moss from the older monkey kids and the older monkey kids chasing it to get it back). I was captivated. I must have taken a million photos of this little couple. I don't believe humans evolved from monkeys, but I can sure see our resemblance. I wanted to sit down with mama monkey and talk childbirth and rowdy toddlers with her over a cup of coffee. And finally the polar bears. Yes, there are polar bears at the Highland Wildlife Park (hey, I think I'm writing my review already! ), it is their main attraction. We watched the polar bears wrestle and play for a long time too. It's such a thought, being that close to something so large and dangerous, separated only by a fence (and at this stage, a car, but at another part of the park, it was just a fence). The bears were great fun to watch, and again, I pretty much depleted my camera battery taking gazillions of shots of them. But I didn't have the same desire to play with them as I did the monkeys. Not quite. Overall, it was a wonderful week. Now we're back home, and I'm looking forward to my darling daughters coming home tomorrow. Life can go back to its regularly scheduled programmes, but hopefully I'll be approaching it from a chilled out, happy place.